Fukushima Prefecture (福島県, Fukushima-ken) is a prefecture of Japan. It is part of the Tōhoku region on the island of Honshu. The capital city of the prefecture is Fukushima. The Fukushima Daiichi Nuclear Power Plant is in this prefecture. The power plant had a meltdown in March 2011. It forced many people in Fukushima to move away from their homes, especially in the Futaba District. Until the Meiji Restoration, Fukushima prefecture was known as Mutsu Province. 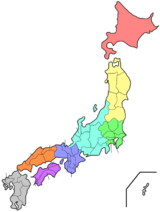 In 1871, the territories of eleven clans were combined into three prefectures: Fukushima, Wakamatsu and Iwaki. On August 21 in 1876, they were united to form the current Fukushima Prefecture. Fukushima is the prefecture that is furthest south in the Tōhoku region. It is the part of Tōhoku closest to Tokyo. Tokyo is about 300 kilometres further south. Fukushima located between 37 and 38 degrees north latitude. Fukushima is divided by mountain ranges into three regions: (from west to east) Aizu, Nakadōri, and Hamadōri. Hamadōri is on the coast of the Pacific Ocean and is the flattest and most temperate region. Nakadōri is the most important farming part of the prefecture. The capital city, Fukushima, is in this area. Aizu is a tourist destination and has many mountains, scenic lakes, forests, and snowy winters. The three main industries in Fukushima are manufacturing, commerce and farming. Fukushima was the largest manufacturer in Tōhoku in 2008. The industry made about 5 and a half trillion yen (¥5,568,600,000,000). Manufacturers relied heavily on electrical power produced locally, much of it from nuclear power stations. Trade, including retail businesses, was the second largest industry in 2008. It made 4.7 trillion yen (¥4,720,600,000,000). In 2009, the prefecture produced ¥245,000,000,000 (245 billion yen) from farming products. About 40%, or ¥94,800,000,000 (94 billion yen), was from rice. Fukushima was the fifth largest rice producer in the country. It also produced large amounts of vegetables, meat, and fish. The two largest agricultural producers were the cities of Fukushima and Kōriyama. Those two areas accounted for more than 15% of agricultural production in the prefecture. ↑ Nussbaum, Louis-Frédéric. (2002). "Fukushima-ken" in Japan Encyclopedia, p. 218. ↑ Nussbaum, "Fukushima" at p. 218. ↑ "History of Fukushima". Retrieved 2014-01-21. ↑ "Location and Traffics". Retrieved 2014-01-14. ↑ Japan Ministry of the Environment, "Bandai-Asahi National Park" retrieved 2012-3-19. ↑ "Fukushima bland product". Retrieved 2014-01-14. This page was last changed on 29 May 2018, at 09:29.